If you are searching for a strong, durable cane that looks good and is also lightweight look no further than the DMI Deluxe Adjustable Walking Cane. You will always find a perfect fit with this cane regardless of your height. With the easy-to-use snap adjustment button, this cane meets all of your personal needs. The adjustable height ranges from 30-39 inches in 1 inch increments. The soft foam grip fits comfortably in your hand, giving you firm control over the cane. Its solid look and design is perfect for men and women and will boost your confidence. Wearing your shoes, naturally stand upright. Put your arms to your side with a natural bend at the elbow. Have someone measure the distance from your wrist joint to the floor. This is the height your cane should be set at. Note: If you cannot have someone measure for you, convert your height to inches and divide by two. Add a half-inch to this height. ADJUSTABLE CANE THAT'S ALSO LIGHTWEIGHT easily adjusts from 30 to 39 inches with a simple button and weighs only 12 ounces. STURDY AND STRONG SLIP RESISTANT OFFSET CANE supports up to 250 pounds and has a rubber tip for stability, helping to prevent slips and falls. SOFT FOAM OFFSET HANDLE WITH CONVENIENT STRAP secures around your wrist to prevent drops and makes it comfortable to grip, even for long periods, helping to reduce hand fatigue and soreness. 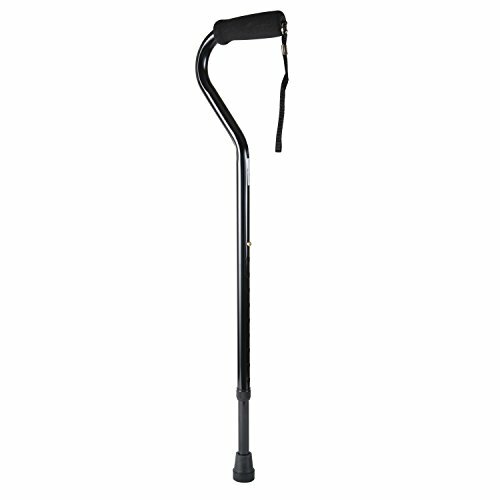 SLEEK SOPHISITCATED CANE DESIGN FOR MEN AND WOMEN that does not look like a medical cane.